Windows 8.1 or higher. You would need Windows 10 in order to develop for UWP. Visual Studio 2017 or Visual Studio 2019 with Xamarin installed. Go to Visual Studio Downloads page to see the available download options. 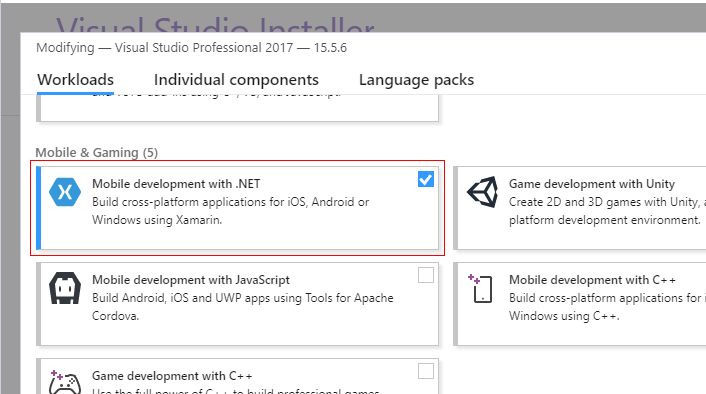 To install Xamarin for Visual Studio 2017/ Visual Studio 2019, you would need to enable Mobile development with .NET workload. If you run a fresh installation of Visual Studio, you will be prompted to select workloads during the installation process. if you already have Visual Studio installed, you could modify the active workloads by re-running the Visual Studio installer and selecting "Modify" option. For more detailed instructions go to Installing Xamarin in Visual Studio on Windows topic in Xamarin documentation. For building iOS apps - configured iOS build host. You will be able to develop Android and iOS apps. The iOS apps will require iOS 8 and higher. Windows apps are not supported on macOS. macOS Sierra 10.12 or higher. Visual Studio for Mac with Xamarin installed. 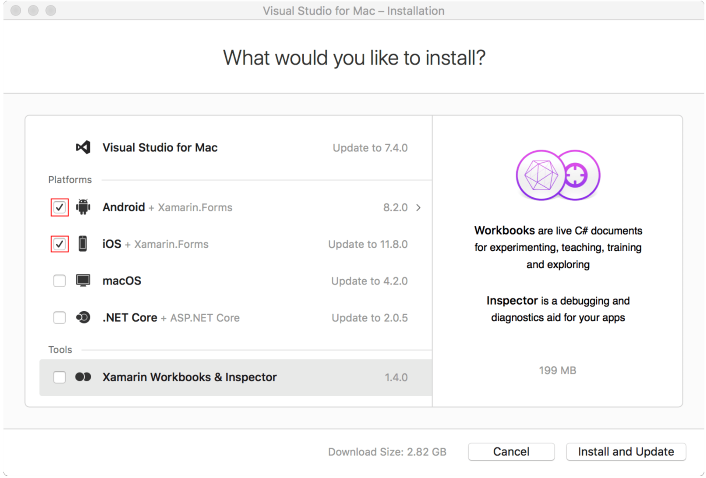 VS for Mac installer inspects your system and verifies which components are installed and which need to be updated. In order to make sure Xamarin is installed, you would need to run the VS for Mac installer and check whether Android and iOS options are enabled. For more information go to Setup and Install Visual Studio for Mac topic. The minimum required version of Xamarin.Forms package is 3.4. The Android project requires multiple packages with specific versions. The Xamarin.Forms package will install most of the required packages as its dependencies. You can then go to Required Android Support Libraries article and check if you have all required files and versions.